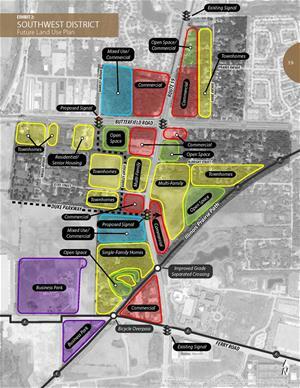 as a component of the City of Warrenville long range Comprehensive Plan. The Southwest District planning area encompasses approximately 370 acres of land along Route 59 and Route 56 intersection and the adjacent sections of the Route 59, Route 56 and Ferry Road. This plan presents a long-term vision of the future for this area of Warrenville and is one of the most important “tools” the City will reference when making decisions related to land use, development proposals, and City investment in this planning area. Paper copies of the Southwest District Plan are available for review at the City of Warrenville Community Development Department.